Foundation relaying becomes necessary when a building or part of it is standing on insufficiently load-bearing ground and settling has resulted. This generally reveals itself in the form of cracks. Where, due to the need for structural alterations or additions, higher loads are going to be transmitted to the building ground and the existing foundations are inadequate, retrospective foundations will likewise have to be laid. Foundation restoration – Old spike pilel It is not uncommon during foundation relaying of old, deeply footed buildings that obstructions such as this old spike pile are come across. 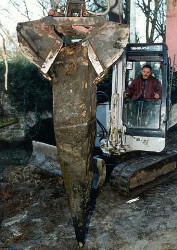 More than one metre of the wooden pile had rotted away in the area of the foundation thereby losing its load bearing function. Relaying foundations with ERKA piles means that the building structure loads are transmitted deeper into the ground. To this end, we insert pre-pressed segment piles under the foundations in the tightest spaces, working from a trench gully. Segments are press-driven into the earth until the necessary predetermined load pressure is reached. Using this flexible process, an optimum pile efficiency can be achieved which will finally, and for the future, carry the working load without distortion. If the existing misalignment of the structure or a part is too great to be tolerated in the long term, then it can also be raised. 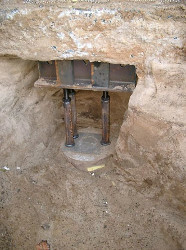 Installed ERKA-Pile – This type of underpinning section still has to be reinforced and concreted after the piles are in place. The beam pressure area is increased using cross beams and steel plates to reduce the point pressure from the masonry.